How does architecture communicate? How do organizations communicate through architecture? The cultural studies academic and architectural journalist Alexander Gutzmer gets to the bottom of these questions - and with this, the mediality of constructed reality. 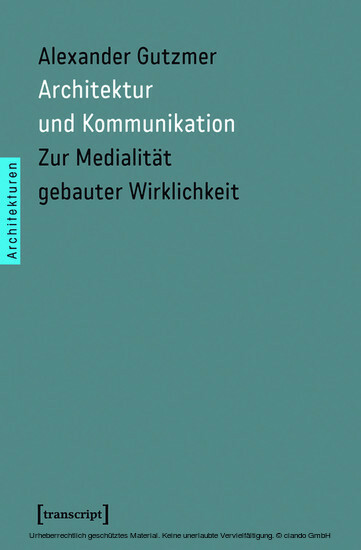 On the basis of theories of architectural experience and actor-network theory, he sketches out a rich image of a world shaped by architecture - and of an architecture influenced by media and culture. Alexander Gutzmer ist Chefredakteur des Architekturmagazins »Baumeister« und Editorial Director des Verlags Georg D.W. Callwey. Zuvor arbeitete der promovierte Kulturwissenschaftler und Diplom-Kaufmann als Editorial Director bei der Hubert Burda-Tochter »Burda Creative«. Gutzmer ist Professor für Medien und Kommunikation an der Quadriga-Hochschule in Berlin.